This morning’s release of January employment and unemployment data from the Bureau of Labor Statistics shows most states began the New Year with relatively strong job growth and continued declines in unemployment. There are now a handful of states with unemployment rates below their pre-recession levels, and the average rate of state job growth over the past three months was more than double its rate from the same period a year ago. From October 2014 to January 2015, 44 states and the District of Columbia added jobs, with Utah (+1.7 percent), Idaho (+1.5 percent), Oregon (+1.1 percent), and Washington (+1.1 percent) experiencing the largest percentage gains. Five states—Kansas, Louisiana, Minnesota, New Hampshire, and South Dakota—had small declines in overall job numbers. One state, Maine, had a more substantial loss of jobs—total employment in Maine fell by 0.8 percent from October to January. In fact, Maine is the only state with a net decline in jobs over the past year (January 2014 to January 2015). Over the same period, unemployment fell in 37 states, rose slightly in 4 states, and was unchanged in 9 states and the District of Columbia. 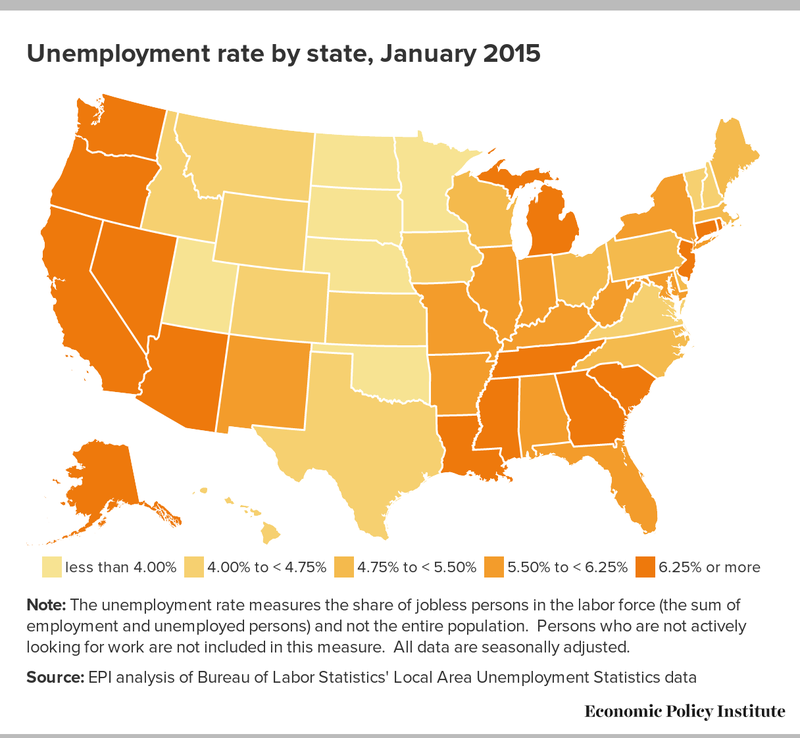 The largest declines in unemployment were in Idaho (-0.5 percentage points), Oregon (-0.5 percentage points), and Rhode Island (-0.5 percentage points). For the most part, these declines in unemployment appear unambiguously positive—with states seeing both increasing numbers of jobs and a growing labor force. 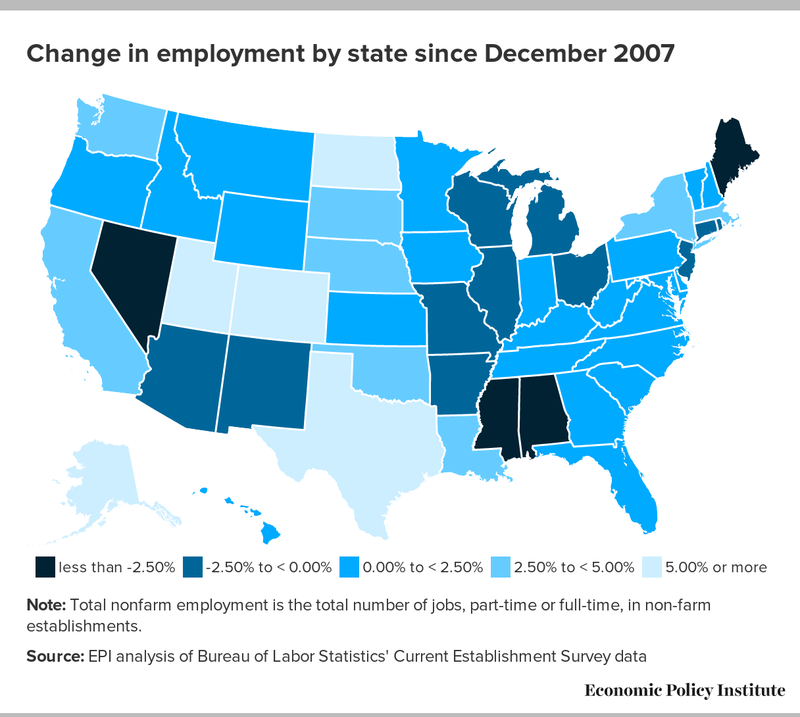 However, the drop in unemployment over this period in a few states was accompanied by significant labor force declines, notably in Maine (-0.5 percent), Rhode Island (-0.4 percent), and West Virginia (-0.8 percent). All three of these states have seen their labor force shrink by more than one percent over the past year, suggesting that at least some of the improvement in the unemployment rate may be due to discouraged job seekers giving up the search, rather than finding jobs. Today’s data are evidence that the labor market is improving. We can be optimistic for 2015, but policymakers should recognize that the damage left by the Great Recession still lingers in most states: wage growth remains anemic and job seekers still vastly outnumber job openings in virtually every sector. Sadly, this has not stopped some states from hampering their own recoveries by prematurely cutting unemployment benefits for workers that lost a job through no fault of their own. This misguided state economic policy makes getting the national policy response correct all the more critical—that’s why the Fed should keep interest rates low until labor markets throughout the country have returned to health.